By the end of year 4, children will apply their understanding of maths to solve a wide variety of problems with more than one step and be expected to prove their thinking through pictures, jottings and conversations. They will continue to make connections between different areas of maths and ask their own questions, working in an organised way to find solutions which help them identify common patterns or any errors more easily. 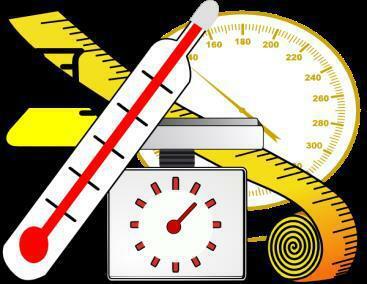 Children will be very familiar with numbers that have up to 4 digits and will be able to order and compare by showing them in different ways such as on a tape measure or using hands-on resources. Using their understanding of place value (how the value of each digit changes depending on its position in the number), children will be able to partition (break and make) numbers in different ways e.g. 2345 = 2000 and 300 and 40 and 5 but could also represent this as 1000 and 1000 and 200 and 100 and 40 and 5 or 2000 and 200 and 145. They will work with numbers securely up to 10,000 and may begin to count beyond in 1s, 10s, 100s and 1000s. 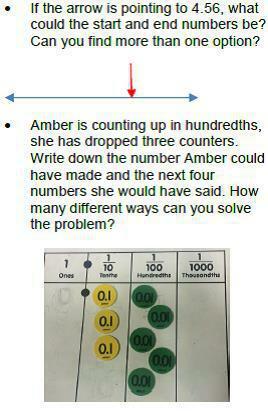 They will use this to help them find 10, 100 or 1000 more or less than any given number. They will multiply and divide whole numbers by 10 and 100 and understand that this changes the value of each digit rather than ‘just adding a 0’. They will develop their understanding to decimal hundredths, comparing and ordering these using contexts such as money. Children will also learn about the pattern to find any Roman numeral to 100. Children will develop their expertise when counting forwards and backwards from 0 to include multiples of 6, 7, 9 and 25; decimals with up to 2 places and fractions. They will be able to fluently count in tenths, hundredths and simple fractions. They will develop their understanding of negative numbers through counting backwards through 0. Children will be able to recognise and describe number patterns and relationships including multiples (e.g. 3, 6, 9, 12 are multiples of 3) and factor pairs (e.g. 1 and 12, 2 and 6, 3 and 4 are all factor pairs for 12) for known times tables. Children will develop various strategies for solving +, -, x, ÷ calculations mentally, using jottings when appropriate and for checking that their answers are sensible. Children will be encouraged to share their methods with others to help them see which work best, are quickest and most accurate. Over the course of the year, children will become fluent in all multiplication and division facts up to 12 x 12 and apply these facts to other problems e.g. 232 x 7 = (200 x 7) + (30 x 7) + (2 x 7). Children will use the = sign to demonstrate equal value e.g. 3 x 8 = 48 ÷ 2 and solve missing number problems e.g. 3 x ? = 48÷2. They will explore patterns and rules for the times tables they learn and use pictures and objects to support their understanding. Children will be required to solve problems accurately using the column addition and subtraction methods for numbers with up to 4-digits and explain how the methods work. They will use apparatus to secure their understanding of these. This will include addition and subtraction calculations with different numbers of digits (such as 1286 + 357); and numbers containing 0s (such as 8009 – 3231). They will use formal written methods of short multiplication and short division for two and three digit numbers by a single digit. 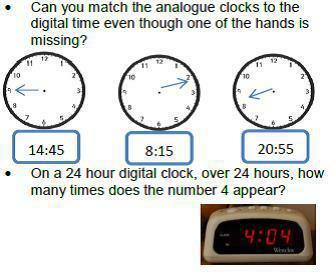 Children who become very adept at these types of calculations will be stretched through problems such as those containing missing numbers so that they know when, if and why they need to use the methods. Children will develop their understanding of fractions by comparing to, or finding a part of, the whole. Through hands-on resources, pictures or jottings, such as a number line, children will add and subtract two fractions with the same denominator (e.g. 2/3 + 2/3). Children will solve problems involving fractions such as ‘find ¾ of 20 litres’ using their knowledge of multiplication and division and through practical equipment. Children secure their understanding that fractions and decimals are different ways of expressing numbers and proportions. problems involving all units of measurement. Children will extend their knowledge of shape to include more unusual quadrilaterals (four-sided shapes) and triangles. They will use increasingly more specific vocabulary such as parallelogram, rhombus and trapezium; scalene and isosceles. 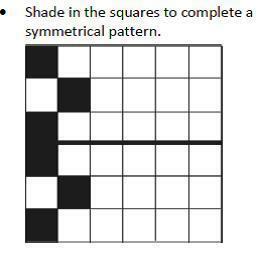 They refine their understanding of symmetry and solve problems where the shape is not displayed in its usual way (e.g. it might be on its side). Children find and name different angles and use this information to decide if a shape is regular or irregular. Children describe position and movement on a grid as co-ordinates and will plot points to draw 2-D shapes. Children will complete, read and interpret information on bar charts; they will solve problems that involve finding information in charts, tables and graphs; including time graphs.